Today Google enabled new Blogger UI (User Interface) to everyone, before it was in Beta stage and can be accessed from Blogger in Draft, now it is completely out from Beta and gone live to everyone’s dashboard. But if you didn’t liked the new UI or still not ready to start with work in new Blogger UI and looking for a way to switch back to old UI then all you need to do is open Blogger dashboard, on top-right corner you will find Blogger Options (Gear) icon, click on it and then select Old Blogger interface. 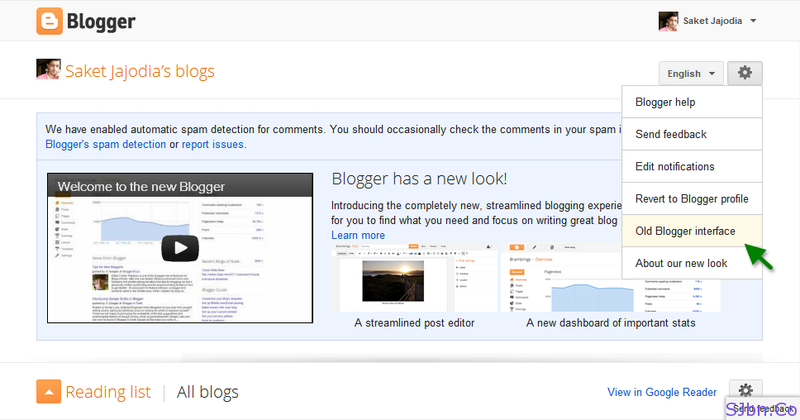 Now your Blogger dashboard page will get refresh and it will revert back to old Blogger UI. But it will last long as in few months Google will completely old UI and make new UI available permanently. So it is suggested to upgrade to new UI ASAP.